Like kids let out for recess, a trio of dogs chase each other around the open floor of The Maryland Dog Spot, happy to play in the vast indoor space that provides plenty of room to stretch their legs. Pearl, a long black-haired English shepherd, deftly weaves around the two bigger dogs, trying to herd them around the room. The largest dog, a lean black and white English pointer named Zwei, leads the trio’s romp. Poppy, a young Chesapeake Bay retriever, takes her cues from the older dogs and appears thrilled just to be running with her animal friends. While it may look like dog chaos, it is decidedly not. Like a circus master, Linda Kaim fills the training floor with her calm presence and directs the show. She is clearly the boss. This 9,000 square-foot refurbished warehouse located at 1907 Bethel Road in Finksburg is the new home for Kaim’s business, The Maryland Dog Spot. Tucked off of Md. 140, the building was once a popular antique business. While this location may be new, Kaim is no stranger to the dog community. 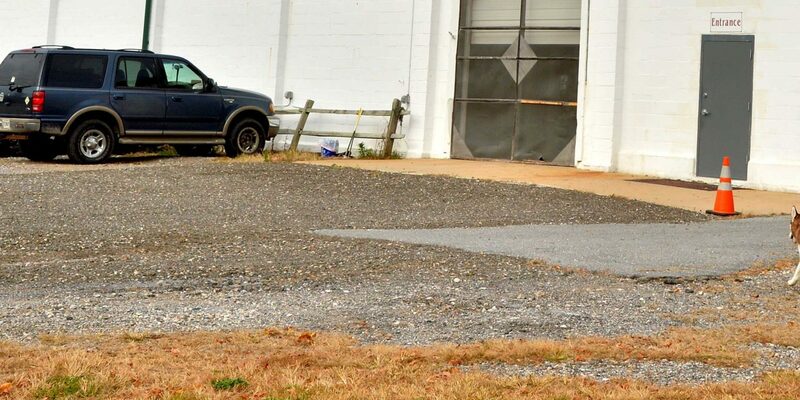 She has been training dogs almost her whole life, running Lionheart K9 Dog Training in the Mid-Atlantic for about 25 years and in Carroll County since 2006. Kim Wolf explains the use of the e-collar transmitter to her husband, Bennett, as Maryland Dog Spot trainer Linda Kaim helps with the explanation while “Niki” looks on. Zwei makes full use of all the space, but never runs far without glancing in Kaim’s direction to see what she may ask of him. Kaim stays in control of the show by interspersing the trio’s romp with her commands. “Zwei, kennel up,” commands Kaim, and the large dog immediately runs over to one of the low training tables, hops up and sits. Poppy and Pearl jump around the box as Zwei obediently awaits Kaim’s next instruction. She quickly releases him, and the trio take another playful lap around the room. With each command – spoken firmly and only once – the two older dogs, both of whom belong to Kaim, eagerly follow her instructions. She calls them her working dogs; they are both highly trained and help Kaim control any group of dogs she has on the floor. A dozen large dog crates line part of one wall inside the building. On this day, six other dogs of various breeds there for day care, boarding or training occupy some of the crates and keenly watch the trio out on the floor. Intermittently, Kaim speaks to these dogs too, commanding one to quiet down or asking Peter to take another one out for a walk. Much of the strength of Kaim’s training programs comes from the consistency of handling and training each dog multiple times every day. Kaim developed her passion and skills in dog training by working under the guidance of top dog trainers in multiple places in the country. 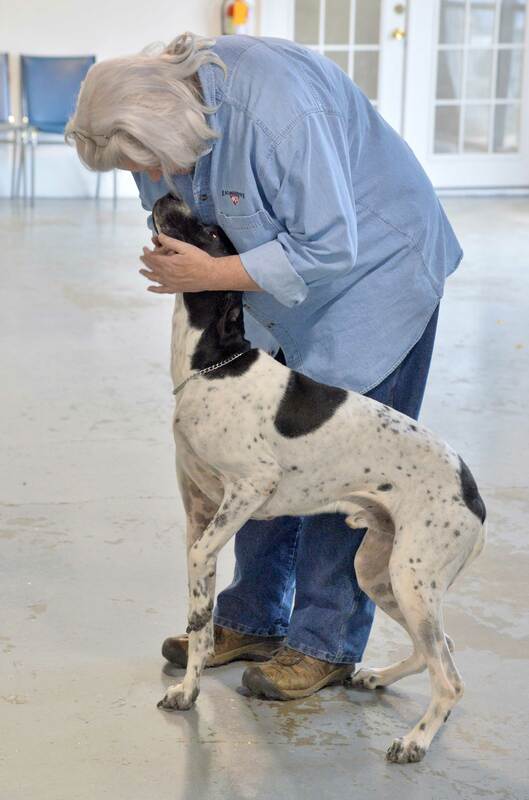 She started Lionheart K9 Dog Training more than 30 years ago. In that time, she has helped owners train their dogs in all capacities, including basic puppy obedience, agility, hunting, service, therapy and law enforcement canine training. Her husband, Peter LoCaccio, and teen-aged son, Conor, also work with her in this family business. Kaim gives dog owners options for group classes, individual lessons, dog daycare and training, and full boarding and training for periods of one to four weeks. At any one time, there are seven to 15 dogs with Kaim for boarding and training. She keeps their numbers small so she and Peter can give each dog individual attention throughout the day. In the evenings, the boarding dogs go home with Kaim and LoCaccio to continue their training in a home environment. 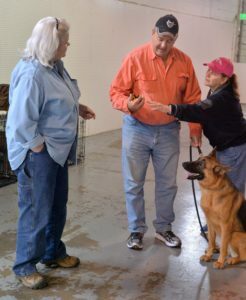 “Our success comes not from having a kennel, but from having a dynamic environment where each dog is handled multiple times a day,” Kaim said. For years, Kaim ran Lionheart K9 Dog Training out of her home in Westminster – three and a half acres and a single car garage bay. But Kaim and her family wanted to separate the business from their home and she needed a larger indoor space in which to work. “Mostly, I couldn’t face another long winter of training dogs out in the cold,” Kaim said. She remembers passing this building 25 years ago and commenting to Peter that it would make a great place for training dogs indoors. Seven years ago, Kaim and LoCaccio started seriously looking for an indoor space for their business. When Kaim saw a sign that their current place was available for rent, they jumped on it. That was in September of 2014. It still took almost a year for the owner to complete the necessary clean up and renovations to the property and for the Kaim and LoCaccio to get the proper zoning for their dog business. Finally, in June of this year, they were able to sign the lease and open The Maryland Dog Spot. Both Kaim and LoCaccio are delighted with the new space. Wernecke, Poppy’s owner, concurred. She drives from Severna Park to train her dog under Kaim’s guidance. Poppy already has two AKC titles in dock diving and her Canine Good Citizen, a necessary first step toward Wernecke’s goal of having Poppy work as a therapy dog. “The new facility is great,” Wernecke said. “Weather is no longer a factor. They are able to bring in the exercise equipment, set up rally and obedience classes, have night classes though the darker winter months. Currently, The Maryland Dog Spot houses Lionheart K9 Dog Training, but Kaim has hopes and plans for more. “Beyond the immediate necessary improvement of getting a big sign outside, we would eventually like to add dog grooming and a self-service wash station, lots more training equipment for the dogs, owner seminars and a club membership that would give owners and their dogs access to dog activities one day a week,” Kaim said. For the time being though, Kaim is thrilled to be out of the cold winter weather and have an indoor place to train dogs.